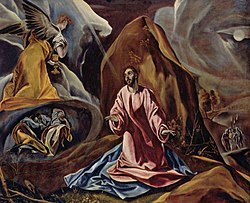 For other uses, see Agony in the Garden (disambiguation). 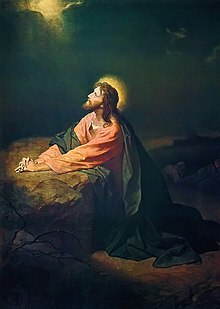 The Agony in the Garden of Gethsemane was an event in the life of Jesus from the New Testament, between the Farewell Discourse at the conclusion of the Last Supper and Jesus' arrest. According to all four Gospels, immediately after the Last Supper, Jesus took a walk to pray. Each Gospel offers a slightly different account regarding narrative details. The gospels of Matthew and Mark identify this place of prayer as Gethsemane. Jesus was accompanied by three Apostles: Peter, John and James, whom He asked to stay awake and pray. He moved "a stone's throw away" from them, where He felt overwhelming sadness and anguish, and said "My Father, if it is possible, let this cup pass Me by. Nevertheless, let it be as You, not I, would have it." Then, a little while later, He said, "If this cup cannot pass by, but I must drink it, Your will be done!" (Matthew 26:42; in Latin Vulgate: fiat voluntas tua). He said this prayer thrice, checking on the three apostles between each prayer and finding them asleep. He commented: "The spirit is willing, but the flesh is weak". An angel came from heaven to strengthen Him. During His agony as he prayed, "His sweat was, as it were, great drops of blood falling down upon the ground" (Luke 22:44). At the conclusion of the narrative, Jesus accepts that the hour has come for Him to be betrayed. In Roman Catholic tradition, the Agony in the Garden is the first Sorrowful Mystery of the Rosary and the First Station of the Scriptural Way of The Cross. Catholic tradition includes specific prayers and devotions as acts of reparation for the sufferings of Jesus during His Agony and Passion. These Acts of Reparation to Jesus Christ do not involve a petition for a living or dead beneficiary, but aim to "repair the sins" against Jesus. Some such prayers are provided in the Raccolta Catholic prayer book (approved by a Decree of 1854, and published by the Holy See in 1898) which also includes prayers as Acts of Reparation to the Virgin Mary. Catholic tradition holds that Jesus' sweating of blood was literal and not figurative. "So, could you not watch with Me one hour?" "Gethsemane (I Only Want to Say)" – In the rock opera Jesus Christ Superstar by Tim Rice and Andrew Lloyd Webber, Jesus sings this song in which He confronts God about His coming fate, ultimately accepting it by the end of the song. An orchestral reprise is heard after the crucifixion in the form of "John Nineteen: Forty-One". A medical interpretative hypothesis of hematidrosis has been advanced in the scientific literature, according to which the great mental anguish that Jesus suffered to the point that His sweat became blood is described only by Luke the Evangelist because he was a physician. Wikimedia Commons has media related to Jesus Christ on the Mount of Olives. ^ Wiersbe, Warren W. (1992). Bible Exposition Commentary, Vol. 1: New Testament. Chariot Victor Publishing. pp. 268–269. ISBN 978-1-56476-030-2. ^ Matthew 26:46; Mark 14:41; cf. John 18:4: "Knowing all that was going to happen to Him"
Slater, Thomas (1911). "Reparation" . In Herbermann, Charles (ed.). Catholic Encyclopedia. 12. New York: Robert Appleton Company. Delany, Francis Xavier (1911). "Raccolta" . In Herbermann, Charles (ed.). Catholic Encyclopedia. 12. New York: Robert Appleton Company. ^ Christopher, Joseph P. (2003). The Raccolta. St. Athanasius Press. ISBN 978-0-9706526-6-9. ^ a b Ball, Ann (2003). Encyclopedia of Catholic Devotions and Practices. Huntingdon, Indiana: OSV Press. ISBN 978-0-87973-910-2. ^ Pope Pius XI (8 May 1928). "Miserentissimus Redemptor". Gillis, James Martin (1907). "Agony of Christ" . In Herbermann, Charles (ed.). Catholic Encyclopedia. 1. New York: Robert Appleton Company. ^ a b Stravinskas, Peter (1998). Our Sunday Visitor's Catholic Encyclopedia. Huntingdon, Indiana: OSV Press. p. 498. ISBN 978-0-87973-669-9. ^ Wakefield, Gordon S. (1983). The Westminster Dictionary of Christian Spirituality. Louisville, Kentucky: Westminster John Knox Press. p. 347. ISBN 978-0-664-22170-6. Doll, Sister Mary Bernard (1910). "St. Margaret Mary Alacoque" . In Herbermann, Charles (ed.). Catholic Encyclopedia. 9. New York: Robert Appleton Company. ^ Edwards, William D.; Gabel, Wesley J.; Hosmer, Floyd E. (March 21, 1986). "On the Physical Death of Jesus Christ" (PDF). JAMA. 255 (11): 1455−1463. CiteSeerX 10.1.1.621.365. doi:10.1001/jama.1986.03370110077025.